After a wonderful weekend of camping with my kiddos it is nice to be back in the air conditioning and doing some quilting. 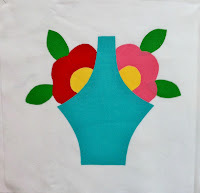 The new free BOM Block is Posted, Spring Basket. Be sure and download the free block by July 15. Are you getting my newsletter? If not you are missing out on the 12" and 16" companion blocks that go with this block! Subscribe to my newsletter and you can get them for free each month! I have been playing around with some new products and thought I would share my reviews with you. Steve and LuAnn Tippets have developed a great new product which deserves to be on everyone's sewing machine table. Their company, Sew Very Smooth, has developed a set of seam guides which are absolutely wonderful. I recently tried these and can tell you they are worth every penny. It is about 3/16" thick plastic guide with adhesive backing. They come in 4 different lengths so you can choose the length you prefer for your machine table. (NOTE: They also sell acrylic machine tables to fit any machine, and polishing kits for your table. -- I got one of their polishing kits and it really makes your acrylic table smooth!) Now for my review: I tried all the lengths and found the two shorter lengths to be the most useful for me. If I was sewing long strips together I might prefer one of the longer guides, but while piecing blocks the shorter one worked great. They are easy to line up and super to ensure a true 1/4" seam, altho you can set them for any seam width. I loved the beveled back which allowed you to grab the back and pull it up when you no longer needed it. This is good because I do a lot of paper piecing and needed it out of the way for that. When I was ready to use it again the adhesive was good as new and stuck right down on my machine and table. Here are a few things I would comment on. Press down hard to be sure you have stuck it down tightly. I didn't have mine stuck down all the way the first time I used it. Second, if you are using an acrylic table, be sure your table and machine throat are level at the same height. Even a small discrepency in height can keep the guide from sticking down firmly to both table and machine throat. Third, I found it more useful for long piecing tasks (long seams, or sewing rows together) than for shorter ones where a piece of tape works good. Lastly, it gets in the way of pins because it is so high. It does remind you to remove those pins or the load them parallel to the raw edge. I would give these a big thumbs up, especially for new quilters or sewers. They are worth the money. But for me, the shorter 3" or 5" guide was more usefull than the longer ones. Next time: The Sticky Roller!! What clever twists for a simple basket block...especially the 12" block!!! Thanks for a lovely blog!